"A COUNTRY INN IN THE COUNTRY". We are a Pet Friendly, award winning, Country Inn set on 400 acres and located 90 minutes south of Montreal and 30 minutes from Burlington and ski areas. Yankee Magazine awarded The Inn at Buck Hollow Farm the BEST PET FRIENDLY B & B IN NEW ENGLAND for 2015. AAA has rated us three diamonds for more than 25 years. We offer a 40 foot pool, a year round hot tub, miles of cross country skiing, snowshoeing, walking trails and an antique shop in our old barn. CHECK THE SPECIALS. No other discount applies.
."A country inn in the country". we are an intimate, family-run, award winning, New England country inn. Guest amenities include, full gourmet hot breakfast catering to all dietary needs, WiFi,satellite television, guest computer,dinner on site upon request, refrigerator,snacks, drinks etc. The Inn is pet friendly (see our pet policies at http://homepages.sover.net/~buckholl/petpolicy.htm) with an array of resident dogs and cats. Our Springer Spaniels ( Elmo and Grover ) boast a huge fan club on Facebook and write a column in our online newsletter. 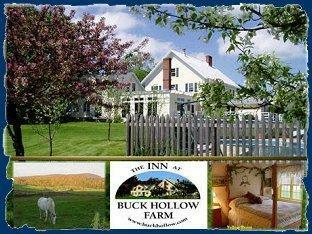 Come and experience the peace, warm hospitality, great food and friendly animals of Buck Hollow Farm. We are usually able to accommodate any diet - Jacquie is vegan. Let us know in advance and we'll work it out. If Jacquie is available we can also offer several dinner options. Again, we need to know in advance. Mention "Inns Mobile" when reserving directly with us (either by phone or through our website - buckhollow.com - for a special rate of $ 100. A savings of 20% . No other discount or special applies. Mention "Inns Mobile" when reserving directly with us for a special rate of $ 15.00 Valid 5/1 - 12/31 only.